The Hateful Eight is the latest movie of the legendary filmmaker Quentin Tarantino. The American western earned about more than 16 million dollars in its first weekend of wide release. It’s hard to find someone who has heard nothing about the sensational film, its extraordinary director and outstanding actors! One of them is the hero of the following interview. Walton Goggins has one of those faces you recognize instantly. You would also be hard-pressed to forget one of the coolest sounding names in Hollywood, so its surprising that the actor isn’t the first person you pick out of the stellar line-up for Quentin Tarantino’s latest film. It is necessary to notice that Tarantino wrote the meaty part of Chris Mannix especially for Goggins. Starring alongside Samuel L. Jackson, Kurt Russell, Jennifer Jason Leigh and Tom Roth, Goggins plays an initially unassuming character in the ensemble for The Hateful Eight. Of course, with this being a Tarantino movie, there is far more than initially meets the eye. 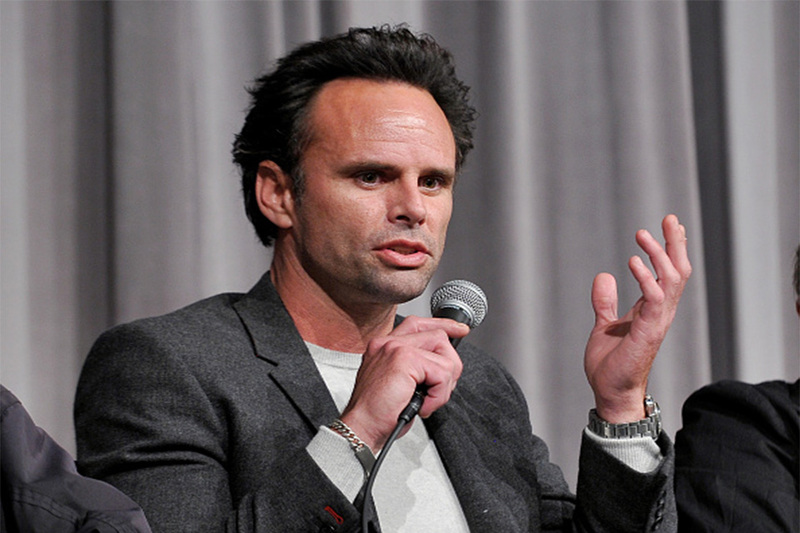 “I’ve been in television in the States for upwards of fifteen years now, so the idea of the three-hour long movie is not that different to me” Goggins replied to HeyUGuys when quizzed about the length of the movie. The film is shot in 70mm, and presented as such. What does the format offer that would otherwise be lacking? I’ve seen it four times in this format. What you realize is that even though all of us were questioning that choice. ‘How and Why in one room?’ It seems like that lens is to capture landscapes, but that’s why he did it. From the first footage we saw in dailies I got it immediately. I was inside that room. I was a part of it on the stage. I understood the complexity of the story that he was telling, because its not just what’s in focus that is the story. Its whoever the person is behind the person in focus. Or even the person behind that person. It goes all the way to what the snow is doing outside. Watch it and see how it accumulates and how angry it gets once night falls. It becomes so claustrophobic. I don’t know if anyone has ever described that format of 70mm as claustrophobic because they are so wide. He knew to do that. The use of the intermission in the movie is, with typical Tarantino attention, perfectly placed in the narrative. It invites repeated viewings too, so is that the point to rewind and watch again? You pick up and realise so much, without spoilers, that the interactions between everyone in that room are so detailed. They are silent and layered, but between everyone in the room. If there is an exception it is my character. You have to question everyone’s motivation and you really have to question Sheriff Chris Mannix’s motivation. Why is he here? That dovetails into the story in a way I could never have anticipated. Is it possible to pick up the motivation of Mannix straight away or is it something that evolves whilst reading the script? He said, ‘I want you to answer that question and I don’t want you to tell me your answer.’ We’ve been doing thos for 18 months now since the stage reading and almost every person that has watched the movie has asked me that question. Every person in the cast, who are my very good friends, are still debating it. Its back and forth. Chris Mannix displays his disdain for his black travel companion from the first moment they meet. Is his world view at the start of the film something that is still present in America? How could it not be? It’s prevalent the world over. What Quentin so deftly articulated in this movie to me – and I don’t know if it is possible to change the hearts and minds of a whole group of people, I think that takes time – but I do know that you can change the heart and mind of just one person. And that happens in this story. It’s unexpected and it is beautiful. It speaks to race-relations at that time and is part of the ongoing conversation. You have to step outside of ignorance. On to TV series Justified – your character Boyd has developed over the course of several series, but are there any similarities between him and Mannix? Originally he was just in the short story by Elmore Leonard. He died, and I died while making the pilot. I’m a huge fan of Timothy Olyphant and all the people at FX. We did The Shield there for several years too. Over the course of the show, when they showed it to people, they said you can’t kill him off. He is the show. I was looking to do something else, so when they offered it to me I said I wanted autonomy over the character. I wanted him to be the smartest person in the room. I wanted to understand three-dimensionally what this relationship is. I didn’t want to sell out where I was coming from. I thought it was an incredible opportunity to explore the poor and disenfranchised in America, and Bucolic America, because I think that audience is so often overlooked. In some ways I feel this is a show for them and that Boyd speaks to them. Six years later I’m still pinching myself to get the opportunity to fully flesh out this very complex person’s point of view.